Volkswagen characterizes the 2020 Passat as a redesigned model, but in reality it is a restyled model. The midsize family sedan, last fully redesigned for 2012 when it moved to the automaker’s Chattanooga, Tennessee factory, gets a new skin, an updated interior, and technology enhancements while retaining its European driving dynamics and roomy seating areas. Initially, Volkswagen will offer an early-build launch edition called the Passat Limited. It has the same powertrain calibration as the outgoing version of the car. Afterwards, powertrain revisions that bump torque output will accompany the four standard trim levels. Volkswagen did not define them, but they are likely to be S, SE, SEL, and SEL Premium. A confirmed R-Line treatment provides a sporty treatment to enhance the car’s European driving dynamics. It’s easy to see the old Passat hiding under the new Passat’s clothing. Patterned after the latest Jetta’s styling, the 2020 Passat has a larger grille, slimmer lighting, greater definition for the hood and door skins, and a tidier tail. Revised rear quarter window shapes give the impression of a faster roofline. Standard equipment includes front and rear LED lighting and a set of 17-inch aluminum wheels. Up to 19-inch aluminum wheels are available, and the new Passat offers an adaptive front lighting system with range control and cornering lights. One of the best things about the previous Passat was its large and roomy interior, and that continues for 2020. This car provides full-size space at a midsize price. For 2020, the Passat’s cabin is updated with new colors, improved materials, and a redesigned dashboard. The most dramatic difference is the full-width slats into which the air vents integrate. It gives the new Passat a modern, architectural look. Cloth seats are standard, with V-Tex leatherette or premium Nappa leather available, depending on the trim level. Typically, to get additional features on a Volkswagen, buyers must upgrade to the next trim level. For 2020, some of those available conveniences include a power driver’s seat with memory settings, dual-zone automatic climate control, keyless access with push-button engine starting, an auto-dimming rearview mirror, and a power sunroof for warm and sunny days. In cold weather climates, 2020 Passat owners will appreciate the available power folding heated side mirrors, heated front and rear seats, remote engine starting, and rain-sensing wipers. The new Passat also offers an Easy Open trunk and voice control of various infotainment system functions. Every 2020 Passat features a turbocharged 2.0-liter 4-cylinder engine making 174 horsepower and powering the front wheels through a 6-speed automatic transmission with a Sport driving mode and available paddle shifters. At first, the Passat Limited launch edition will supply 184 lb.-ft. of torque. 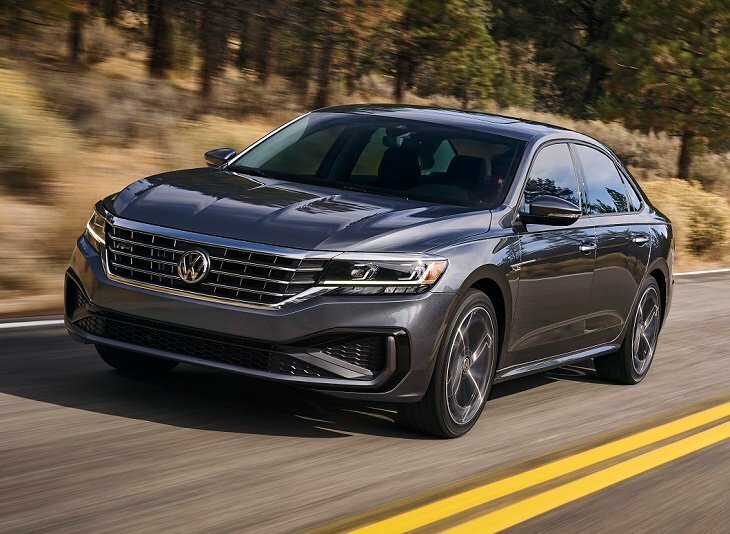 When remaining trim levels come online, they’ll benefit from new software and a new torque converter that bumps output to 207 lb.-ft.
Like all VWs, the new 2020 Passat comes with a 6-year/72,000-mile transferable bumper-to-bumper warranty with roadside assistance. With the new Passat, Volkswagen expands the car’s list of standard driver assistance and collision avoidance technologies. Previously, blind spot monitoring with rear cross-traffic alert was standard. That continues for 2020, those features joined by forward collision warning with pedestrian detection and automatic emergency braking. Another standard feature is automatic post-collision braking. This brings the Passat to a stop as soon as is possible following a collision, the goal to prevent secondary impacts that could injure passengers after initial deployment of the airbags. Volkswagen continues to make adaptive cruise control and lane departure warning with lane keeping assist available, and versions of the car with lane keeping assist also get active blind spot monitoring designed to prevent a driver from drifting into an adjacent vehicle. The Passat also offers VW Car-Net Security & Service with such features as automatic collision notification, SOS emergency calling, and settings related to safe teen driver operation. Another interior highlight for 2020 is the Passat’s standard touchscreen infotainment system, mounted under a flush glass surface. More sophisticated than was the previous Passat offered, the new system includes a free 3-month trial of SiriusXM satellite radio services as well as Car-Net App Connect with Apple CarPlay, Android Auto, and MirrorLink smartphone integration platforms. Options include a larger 8-inch display (up from the standard 6.3-inch screen), a navigation system, and a Fender premium sound system. Additionally, an available parking assistant system with front and rear parking sensors can help a driver to steer the car into a parking space.